Upon going north to Delmar you can quickly tell you’re suddenly in a different place. The store is now closed. I’ve been reviewing materials on revitalizing low-income areas and one theme is repeated: JOBS! Critics would correctly point out it would take a lot to convince an employer to move their business to a depressed low-income area, that’s why the business and jobs must be created from within. Anchor institutions—hospitals, colleges, and other institutions deeply rooted in their communities—are a form of commons that is viewed as crucial to revitalizing low-income neighborhoods. Besides being major employers and big customers for local businesses, they have an intrinsic stake in making sure their neighborhoods thrive. Your local hospital, for instance, is not going to pack up its beds and move to Mexico. The Evergreen Cooperatives of Cleveland, Ohio are pioneering innovative models of job creation, wealth building, and sustainability. Evergreen’s employee-owned, for-profit companies are based locally and hire locally. They create meaningful green jobs and keep precious financial resources within the Greater University Circle neighborhoods. Worker-owners at Evergreen earn a living wage and build equity in the firms as owners of the business. The strategic pillars on which the Initiative is built are: (1) leveraging a portion of the multi-billion dollar annual business expenditures of anchor institutions into the surrounding neighborhoods; (2) establishing a robust network of Evergreen Cooperative enterprises based on community wealth building and ownership models designed to service these institutional needs; (3) building on the growing momentum to create environmentally sustainable energy and green collar jobs (and, concurrently, support area anchor institutions in achieving their own environmental goals to shrink their carbon footprints); (4) linking the entire effort to expanding sectors of the economy (e.g., health care, our aging population, local food, and sustainable energy), many of which are recipients of large-scale public investment; and (5) developing the financing and management capacities that can take this effort to scale (that is, to move beyond a few boutique projects or models to have significant municipal impact). In the 2nd post, above, I listed the major institutions in the area. Between them they hire out for many goods & services. It’ll take a lot of effort to do what Cleveland has done, but I don’t think we have a choice in the matter. There’s no guarantee this will work, it certainly isn’t a magic bullet to solve all the ills. If you’ve got another idea I’d love to hear it. 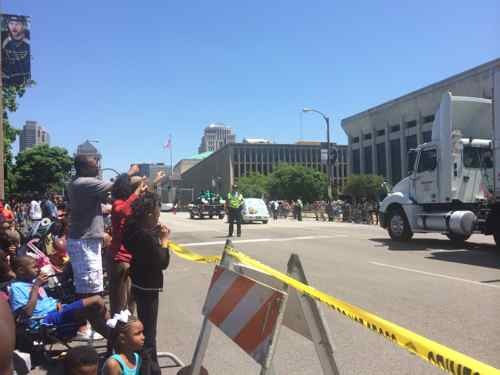 The annual Annie Malone parade on Sunday was a nice family event, but one entry drew jeers not applause from spectators. It was nice to see his passion, especially after all the businesses in the parade. 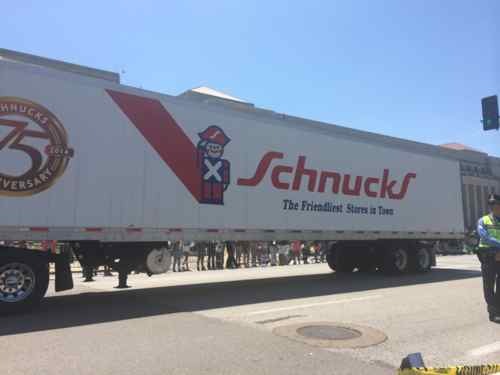 After visiting the now-closed Schnucks store I understand the business decision. I do think Schnucks, through their development company DESCO, could’ve been working on building a new location for years. Closing the north Grand location because a new store opened nearby would’ve gotten Schnucks a different reaction from those at the parade. Recently I suggested the 9th & 10th one-way couplet should be returned to two-way traffic. I emailed numerous official a link to the post along with a brief summary, I heard back from only two; Ald. Tammika Hubbard replied within a day and a few days later St. Louis Traffic Commissioner Steve Runde replied. Runde confirmed it was doable, but traffic signal work can be costly. Both said it’s up to the neighborhood. That meant it was up to me if anything was going to change. The one-way couplet exists in two neighborhoods, in two wards: Downtown in the 7th Ward and Columbus Square in the 5th Ward, with Cole Street the dividing line (in more ways than one). Many of these apartments are managed by McCormack Baron Ragan so I’ll contact them to find people to talk to. I’ve also started gathering data, the width of various streets are different points. Thankfully my fiancé DJF was able to help by operating the measuring wheel. 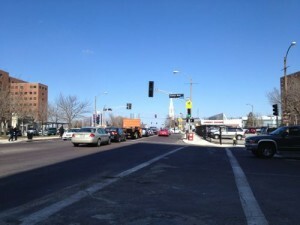 I was surprised when we saw that 9th Street is 5 feet wider in the Columbus Square neighborhood, compared to downtown. Tenth Street varied widely, we need to measure in more places. 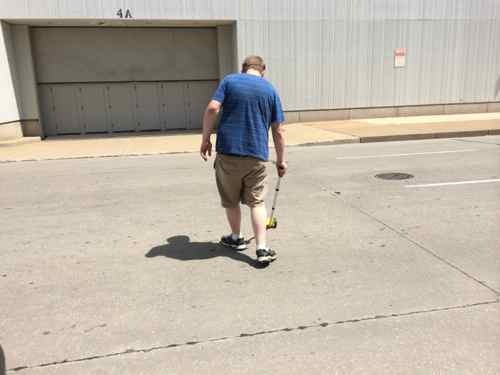 Based on the perception that wider lanes are safer, the St. Louis region has historically used 12-foot travel lanes for many thoroughfares. Recent studies show that at speeds of 35 mph or less, there is very little difference in substantive safety performance for lane widths of ten, eleven, and twelve feet. Narrower travel lanes can also have a TRAFFIC CALMING effect on a thoroughfare by causing vehicles to drive slower. Conversely, wider lanes often encourage motorists to travel above the facility’s target speed. If narrower lanes are chosen, it is important to carefully design the pavement (whether flexible or rigid) to maximize pavement life cycle. Pavement selection for narrower lanes should focus on durability to offset the effects of a confined wheel track space, which can produce early fatigue. Design narrow lanes. Because slower speeds are desirable, lane widths under twelve feet are recommended, with 10′ as the minimum. Tables 6.2 and 6.3 of the ITE publication Context Sensitive Solutions in Designing Major Urban Thoroughfares for Walkable Communities provides excellent design parameters for ARTERIAL and COLLECTOR streets. These tables recommend a lane width of 10-11′ for the majority of place types, including those discussed in this guide. Chapter 9 of the ITE publication also provides useful guidance on lane width. An on-street parking lane needs 8 feet, or 16 feet for both sides. Ten feet is a good width for a local neighborhood street. Both 9th & 10th have extra width,though the amount varies. How should this extra width get used up: bike lane, median, wider parking/travel lanes? Maybe residents like having 9th & 10th as one-way streets, though I doubt it. In a future post I’ll look at 9th & 10th south of Cole Street, including going back to a traffic study from December 2005. In a post last week called Rethinking the North Grand Corridor for Jobs, Economic Opportunity I introduced the idea of a collaborative effort to do a corridor study of North Grand from Delmar to I-70, roughly 2.5 miles. 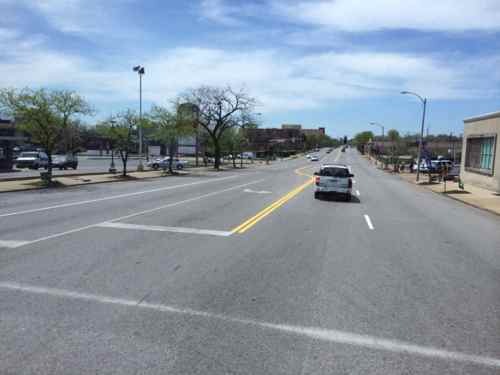 Looking south on Grand from N. Florissant Ave.
Today I’ll continue this line of thought by identifying institutions/businesses/amenities on or near Grand that might be helpful in this process. There are likely many more places that can serve as anchors. Grand from Natural Bridge to I-70 is the The Grand Boulevard Vending District, so perhaps this can become an area where retail activity is organized, concentrated, & marketed. 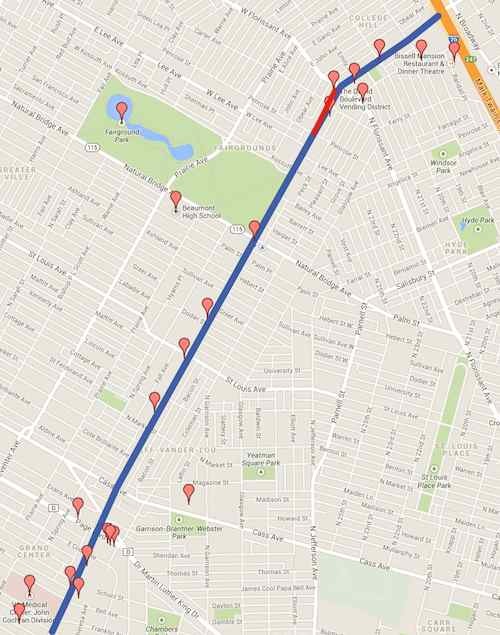 Maybe the 2.5 mile length is branded as one district or maybe it it broken up into segments. It primarily passes through two wards: 3 & 19. Two more wards have a few blocks each: 2 & 4. And a few more wards are very close to North Grand: 5, 18, & 21. So I’ve identified most of the players that could be involved in coming together to closely examine North Grand, developing a master plan, a marketing plan, etc. 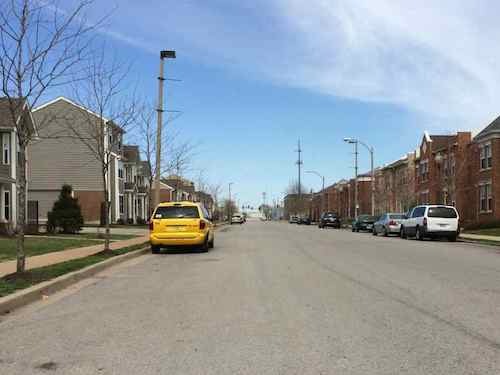 Grand Boulevard is one of, if not the most, important north-south streets in St. Louis. It connects north & south St. Louis to the east-west central corridor. It carries our busiest MetroBus route, the #70. 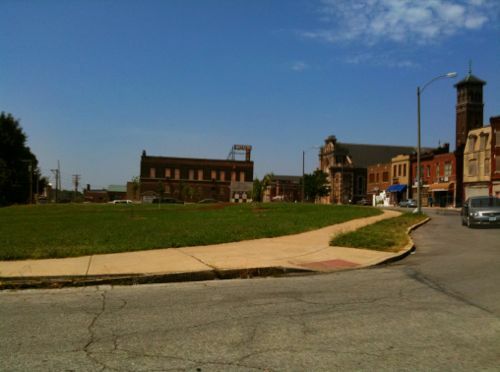 After visiting the soon-to-close Schnucks at Grand & Kossuth last week it occurred to me the North Grand corridor could benefit from some comprehensive planning to bring needed jobs, housing, retail, etc to north St. Louis. This post isn’t a comprehensive solution it’s an introduction to the idea of concentrating efforts in a linear fashion along Grand north of Delmar. Despite massive population loss in the city, especially north city, the areas near Grand remain populated, in-part because of the #70 MetroBus route. The #70 MetroBus route will get five (5) higher-capacity articulated vehicles starting in June, by the end of summer all 12 will be articulated. Vacant land ready to build on. We could list more negatives, as well as positives. In fact, taking stock of the area is a good first step. Bringing real jobs to this area won’t be easy. I don’t think we should just sit back and watch as jobs and people continue to leave the area. This is a chance to do some grassroots planning. Done right North Grand can have a more prosperous future.